This is the fourth in a multi-part series in which we explore and compare various deep learning tools and techniques for market forecasting using Keras and TensorFlow. In Part 1, we introduced Keras and discussed some of the major obstacles to using deep learning techniques in trading systems, including a warning about attempting to extract meaningful signals from historical market data. If you haven’t read that article, it is highly recommended that you do so before proceeding, as the context it provides is important. Part 3 is an introduction to the model building, training and evaluation process in Keras. We train a simple feed forward network to predict the direction of a foreign exchange market over a time horizon of one hour and assess its performance. In the last post, we trained a densely connected feed forward neural network to forecast the direction of the EUR/USD exchange rate over a time horizon of one hour. We landed on a model that predicted slightly better than random on out of sample data. We also saw in our learning plots that our network started to overfit badly at around 40 epochs. In this post, I’m going to demonstrate some tools to help fight overfitting and push your models further. Let’s get started. 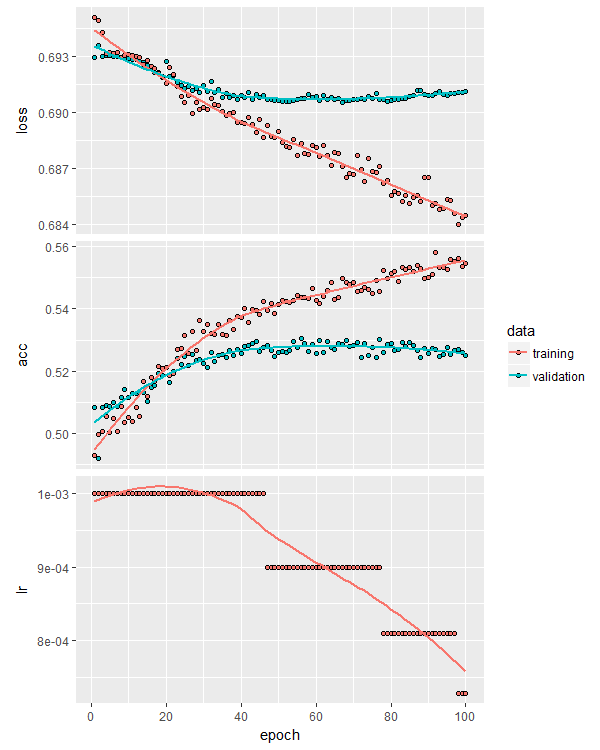 Regularization is a commonly used technique to mitigate overfitting of machine learning models, and it can also be applied to deep learning. Regularization essentially constrains the complexity of a network by penalizing larger weights during the training process. That is, by adding a term to the loss function that grows as the weights increase. regularization_factor * weight_coefficient^2 is added to the total loss, depending on the type of regularization chosen. When we add regularization to a network, we might find that we need to train it for more epochs in order to reach convergence. This implies that the network might benefit from a higher learning rate during early stages of model training. However, we also know that sometimes a network can benefit from a smaller learning rate at later stages of the training process. Think of it like the model’s loss being stuck halfway down the global minimum, bouncing from one side of the loss surface to the other with each weight update. By reducing the learning rate, we can make the subsequent weight updates less dramatic, which enables the loss to ‘fall’ further down towards the true global minimum. epsilon parameter, which controls the threshold for measuring the new optimum. Setting this to a higher value results in fewer changes to the learning rate. This parameter should be on a scale that is relevant to the metric being tracked, validation accuracy in this case. This particular training process resulted in an out of sample accuracy of 53.4%, slightly better than our original unregularized model. You can experiment with more or less regularization, as well as applying regularization to the bias terms and layer outputs. Dropout is another commonly used tool to fight overfitting. Whereas regularization is used throughout the machine learning ecosystem, dropout is specific to neural networks. Dropout is the random zeroing (“dropping out”) of some proportion of a layer’s outputs during training. The theory is that this helps prevents pairs or groups of nodes from learning random relationships that just happen to reduce the network loss on the training set (that is, result in overfitting). Hinton and his colleagues, the discoverers of dropout, showed that it is generally superior to other forms of regularization and improves model performance on a variety of tasks. Read the original paper here. rate parameter. In practice, dropout rates between 0.2 and 0.5 are common, but the optimal values for a particular problem and network configuration need to be determined through appropriate cross validation. At the risk of getting ahead of ourselves, when applying dropout to recurrent architectures (which we’ll explore in a future post), we need to apply the same pattern of dropout at every timestep, otherwise dropout tends to hinder performance rather than enhance it. Notice that it doesn’t overfit significantly worse than the shallower model. Also notice that it didn’t really learn any new, independent relationships from the data – this is evidenced by the failure to beat the previous model’s validation accuracy. Perhaps 53% is the upper out of sample accuracy limit for this data set and this approach to modeling it. reduce_lr_on_plateau callback and kick off training with a higher learning rate, which can always be decayed as learning stalls. 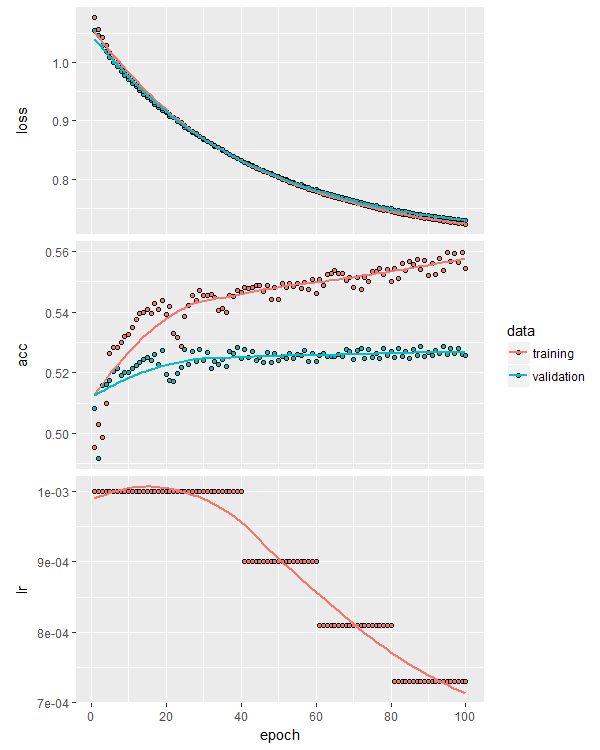 Finally, one important consideration when using dropout is constraining the size of the network weights, particularly when a large learning rate is used early in training. In the Hinton et. al. paper linked above, constraining the weights was shown to improve performance in the presence of dropout. Interestingly, every experiment I performed in writing this post resulted in a positive out of sample equity curve. The results were all slightly different, even when using the same model setup, which reflects the non-deterministic nature of the training process (two identical networks trained on the same data can result in different weights, depending on the initial, pre-training weights of each network). Some equity curves were better than others, but they were all positive. Of course, as mentioned in the last post, the edge of these models disappears when we apply retail spreads and broker commissions, but the frictionless equity curves demonstrate that deep learning, even using a simple feed-forward architecture, can extract predictive information from historical price action, at least for this particular data set, and that tools like regularization and dropout can make a difference to the quality of the model’s predictions. One of the more cutting edge architectures to get the most out of a densely connected feed forward network. How to interrogate and visualize the training process in real time. 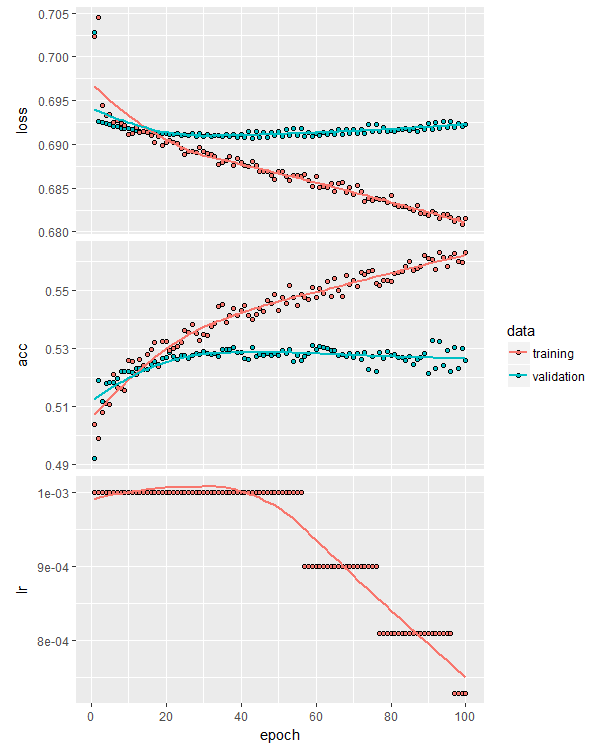 This post demonstrated how to fight overfitting with regularization and dropout using Keras’ sequential model paradigm. While we further refined our previously identified slim edge in predicting the EUR/USD exchange rate’s direction, in practical terms, traders with access to retail spreads and commission will want to consider longer holding times to generate more profit per trade, or will need a more performant model to make money with this approach. Be sure to check out Part 1, Part 2, and Part 3 of this series on deep learning applications for trading. If you’re ready to go deeper and get more practical tips and tricks on building robust trading systems, consider becoming a Robot Wealth member.